The agency has finally acknowledged what we have long known and reported: That a 2016 tax increase would have, in large part, back-filled a previous tax increase and the promises it would come up short of fulfilling. Something remarkable happened Friday. It was so obvious, and we had already reported it so many times, it may seem unremarkable. But it’s not. SANDAG’s leadership formally acknowledged that it could not make good on promises it made to voters in TransNet, a 2004 half-cent sales tax extension. The agency’s job now is to decide which remaining projects will get the remaining share of expected funding, and which will be eliminated. At risk are projects like express lanes on Interstates 8 and 5, widening of State Route 67 and express lanes for Interstate 15 and Interstate 805. At least 15 projects like that are not yet underway and thus in jeopardy. The thing is, they knew this. They knew this was what was at stake. In 2016, Andrew Keatts broke the first few stories describing how the San Diego Association of Governments had systematically projected higher revenues from TransNet than were coming in. And, he revealed, the agency was using that same model to project revenues for a new tax increase that was on the ballot, 2016’s Measure A. Turns out, we all did. Soon after that measure failed at the ballot, then-Supervisor Ron Roberts, who was also chairman of the SANDAG board, wrote an op-ed for us in which he went right at the biggest question at hand. “SANDAG Can Still Deliver on TransNet Promises” was the headline. This was the primary explanation about why nothing truly nefarious had happened. Projecting long-term revenue from any kind of system is extremely difficult. They were off. They were sorry. It was a mistake but nobody stole money. Nobody wasted it. It is one thing to find out there’s something wrong with your projections. We do not expect public officials to have clairvoyant powers. But when SANDAG officials found out, they actively suppressed the information and then asked for another tax increase. That means that not only was SANDAG misleading voters on what 2016’s Measure A could have built but it is clear now the money from Measure A would have been used to backfill previous promises from TransNet. It was like a Ponzi scheme that needed one more investor to keep losses from showing up. The word “similar” was doing a lot of work. SANDAG had been able to attract matching funds from the state and federal governments at about a 3:1 ratio. If SANDAG has $1 million for a project, it has usually been able to count on being able to bring in another $3 million for it. But even Roberts acknowledged the ratio now needed would actually be $3.40 to $1. He pretended like that was a rounding error, but it represents hundreds of millions of dollars. What SANDAG’s staff revealed Friday is that the agency now needs matching funds amounting to $4.20 to $1. 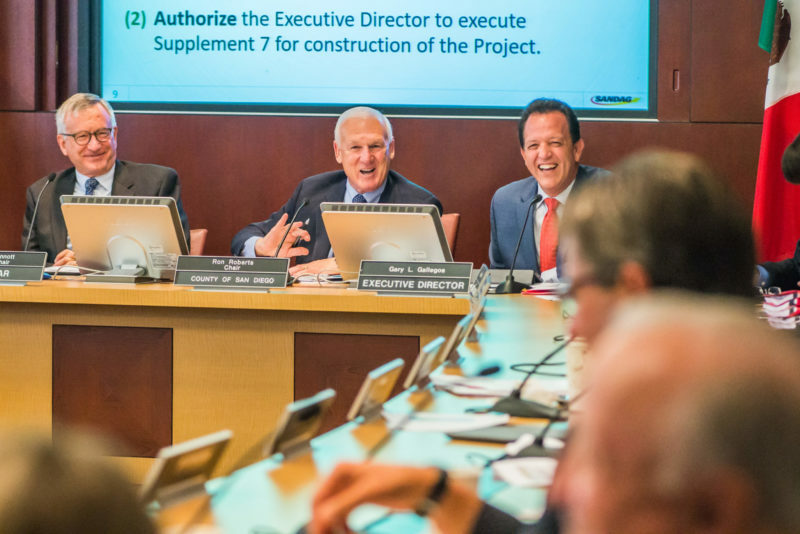 And when a staff member suggested they may still be able to get there, Hasan Ikhrata, the new executive director of SANDAG, shut him down and said no, not even the old requirement of $3.40 is realistic. They could only hope for the old $3 – and even that was far from assured. And that’s why tough decisions are now required. The discussion was refreshing to many. “The good news is the public is getting the unvarnished truth, and I think that’s an indicator of a new day at SANDAG,” said Poway Mayor Steve Vaus. That’s nice and we should welcome honest governance, but we should also recognize what has just occurred. The agency acknowledged that this wasn’t just an error. It was an error that leaders of a government agency were unwilling to confront. They actively attacked people who were pointing it out. And worse, when it became obvious internally, they nonetheless tried to sell the public on a new tax promising all the things they could build – all the open space they could protect, the congestion they could assuage and the transit they could construct – even though they had all the information necessary to know the new money would in fact go to covering the old promises.